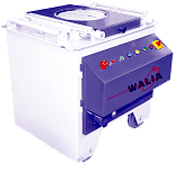 WALIA BAR BENDING MACHINE MODEL PP-32 (B): Suitable to bend Re-Bars of 8 to 32mm dia, up to 1800 Angle (Maximum), Automatic Bend Angle setting, Table speed-5 to 6 RPM, complete with a set of Bending Rollers & Pins, Powered by 5 h.p. 1440 RPM III ph. Electric Motor. 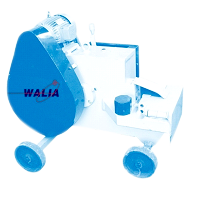 WALIA BAR CUTTING MACHINE MODEL PP-32 (C): Suitable to cut Re-Bars 8 to 32mm dia, stroke in 5 secs. Complete with a set of shear blades with multiple cutting edges, Powered by 5 h.p. 2800 RPM III ph. Electric Motor.